His name isn't Furt Bent, and he isn't from Aldaheit. He's the persona that Osgood Sneddon invented for himself to rise above the mundane, and extricate himself from trouble when a moment's misunderstanding lands him on the wrong side of the law. Detective Inspector Hubbard is po... read full description below. His name isn't Furt Bent, and he isn't from Aldaheit. He's the persona that Osgood Sneddon invented for himself to rise above the mundane, and extricate himself from trouble when a moment's misunderstanding lands him on the wrong side of the law. Specifically, he falls on the wrong side of Hubbard - and that's the wrong place to be. Detective Inspector Hubbard is poisonous, profane and effective, and he doesn't let the truth get in the way of a result. Furt Bent, shaped by the folly of youth and the front yards of Australasia's nastiest prisons, becomes his nemesis. They stalk each other across the pages of this dark, artfully written novel in a story resonant with authenticity. Savour the bitter piquancy, where Underbelly meets Shawshank. 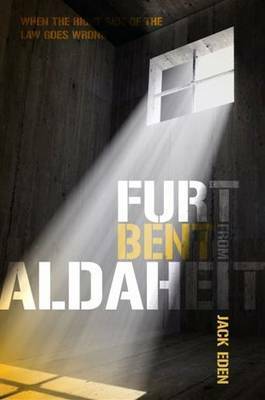 The novel Furt Bent from Aldaheit was inspired by events in 1971 when, at age 19, the author founded a newspaper in a country town near Auckland. He published a story on the innocence of a farmer found guilty of a double murder, and was visited by investigating officers for whom the story was an embarrassment. Eden left the town, and his newspaper, and headed north to the Hokianga where he met several Vietnam War draft dodgers (subject of new novel Jetsam's Caress). He continued in journalism, working on several community and daily newspapers in New Zealand and Australia. He started writing novels seriously in 2005, and has completed seven, two of which have been published. Memories of the events surrounding those early days of writing about Arthur Alan Thomas stayed with me. Furt Bent from Aldaheit is a work of fiction, but it is fair to say it is inspired those events.